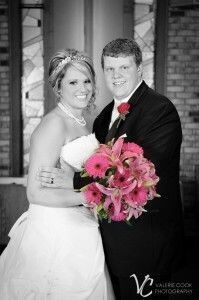 Wedding photographer Valerie Cook took these beautiful shots of a recent wedding in Sidney, IL. Thank you Valerie! 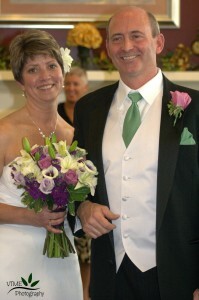 The bride carried Bernini Lilies and Malibu Gerbera Daisies and the groom wore a hot pink rose boutonniere. 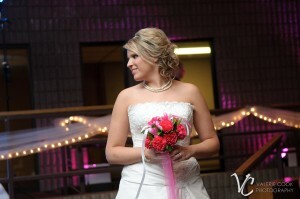 Most receptions include a bouquet toss but it would be silly and dangerous to through the actual bridal bouquet. We create a safer and more economical bouquet for this tradition. 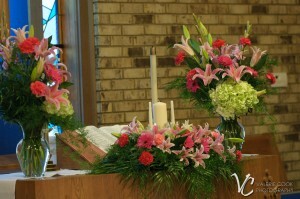 Flowers can play double duty when they are featured at both the ceremony and the reception. Here 2 vased arrangements were used on the altar and on the cake table. For the ceremony the unity candles were incorporated into an arrangement for the center of the alter. 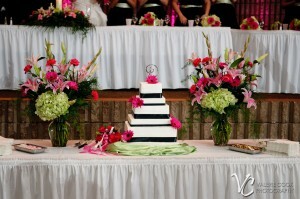 At the reception the cake took center stage and was accented with a few fresh Gerbera daisies. Best wishes for a blessed marriage to the happy couple. Thanks again to Valerie Cook Photography! 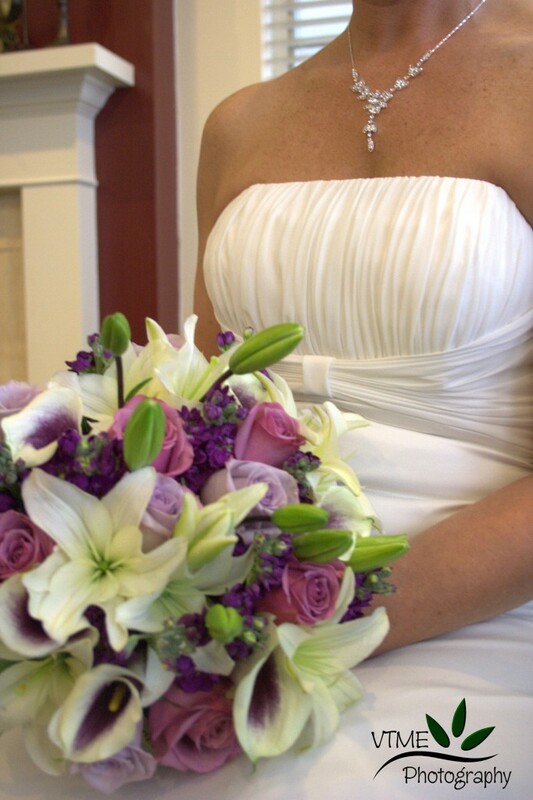 Karen carried a lush garden inspired bouquet of lavenders, purples, and ivories. Two shades of lavender roses and purple stock are the perfect backdrop for romantic ivory asiatic lilies and dramatic Picasso mini callas. A big thank you to Kaula Fitzsimmons of View Through My Eyes Photography for sharing these beautiful wedding photographs. 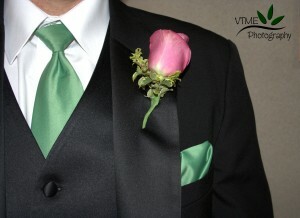 The groom’s boutonniere was a rose in the darker lavender shade accented with variegated greens to complete the garden look. Thank you to the happy couple for choosing Blossom Basket to be your florist! Jennifer with Story to Tell Photography was sweet enough to share her images of a recent wedding filled with shades of purple. 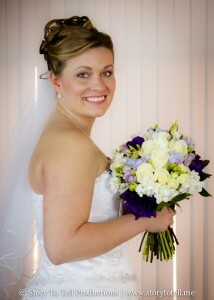 The bride, Kari, carried a white bouquet accented with lavender and purple. Roses, freesia, stock and lisianthus come together in a romantic and fragrant hand tied bouquet. Bridesmaids carried coordinated bouquets in every shade of purple – from light lavender Blue Bird roses to plum Moonvista carnations. 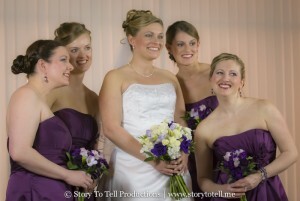 Thanks again to Story to Tell Photography for sharing these lovely pictures.